/ Modified nov 26, 2016 8:15 a.m.
Sen. Jeff Flake, U.S. Ambassador to Mexico Roberta Jacobson and Mexican Secretary of Finance Jose Antonio Meade. Sen. Jeff Flake of Arizona, in meetings with top Mexican government officials this week, emphasized what he called mutually beneficial commercial ties between the U.S. and Mexico and the benefits of a likely renegotiation of a trade agreement for the two countries. Flake, during a three-day visit to Mexico City, said he was trying to improve diplomatic and business relations after President-elect Donald Trump’s polarizing campaign statements about Mexico. Flake pledged to lobby Senate colleagues on trade between the two countries. The North American Free Trade Agreement, which Trump has promised to renegotiate or terminate, has helped both economies, Flake said. "As a border-state senator, I see my role as touting the benefits of trade agreements," Flake said in an interview. Flake’s visit immediately followed Trump’s promise to quit the Trans-Pacific Partnership in his first 100 days in office, and to renegotiate or terminate NAFTA. According to the Arizona-Mexico Commission, the state’s ports of entry with Mexico saw $30 billion worth of trade last year. Cross-border trade supports some 90,000 jobs in Arizona. 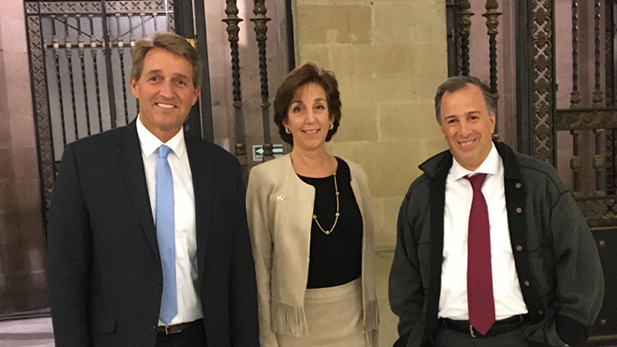 Flake met with Mexican Finance Secretary José Antonio Meade and Economy Secretary Ildefonso Guajardo Villarreal Tuesday and was scheduled to meet with Foreign Relations Secretary Claudia Ruiz Massieu Wednesday morning. MORE: Business, Economy, Fronteras Desk, Mexico, News, U.S.